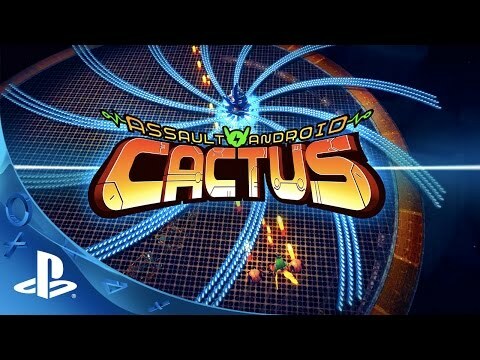 Assault Android Cactus is an intense arcade style twin stick shooter - pick from one of nine unique synthetic heroines and blast your way through overwhelming robots hordes to save the ship from its own workforce. Cactus finds more than she was expecting when she investigates the Genki Star, and finds the massive space freighter disabled and under attack by its own robot crew. Throwing herself into the storm, she recruits other androids unaffected by the malfunction, and now heading up a small but growing team of synthetic heroines, they must sweep the ship and stop the four massive Section Lords to have any hope of regaining control of the situation. Her journey will take her through the ship and outside it as Cactus and her team make their way towards the heart of the ship, where the silent Nexus Core waits along with their only hope of restoring function before the robot uprising can hunt down the last of the survivors. Utilizing a draining battery mechanic in place of lives, Assault Android Cactus challenges you to think fast and keep the bullets flying, blending the gameplay of western styled arena shooters with aspects of Japanese style bullet hell and combining transforming stages, massive boss battles and an eclectic cast of characters with unique ways to play. By flipping convention on its head, stages and Boss Battles become desperate attempts to inflict damage before your battery runs down, encouraging a high speed high stakes approach and inviting creative new tactics.